The New Public Questions Format! With the new Public Questions format introduced recently, the wider community literally has no idea as to what the public question was, nor the answer, if the questioner was not present in the gallery at the time the item comes up in the agenda. 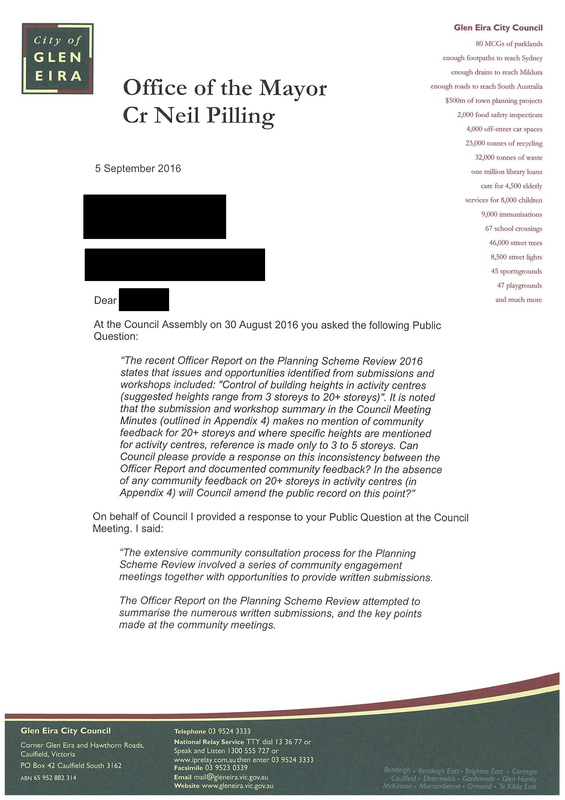 Given that public questions occur at the end of the meeting (and this can be hours and hours later) it is no wonder that some residents might simply give up and leave or simply cannot abide the thought of 2 to 2 and a half hours of woeful arguments and plenty of hot air and grandstanding. Nor do these new protocols take into consideration that someone might be ill and unable to attend. Councillors Hyams, Lipshutz, Esakoff, Pilling,and Ho have therefore successfully limited public access to resident views and queries since the questions and responses are not recorded in the minutes. We’ve however been able to subvert this anti-democratic practice by publishing one of these questions! Please note the answer and make up your own minds as to its veracity and faithful ‘reporting’ of events. I am aware of two Planning Scheme Review sessions, one at the Moorleigh Community Reserve and the other at Packer Park and 20 storeys was certainly not “suggested” as an outcome at either. Did anyone attend any other community sessions and if so was 20 storeys “suggested”? I went to the one at Caulfield park. No one there asked for 20 storeys and I talked with stacks of people at the end. The answer to the question is given in the last paragraph of the letter. 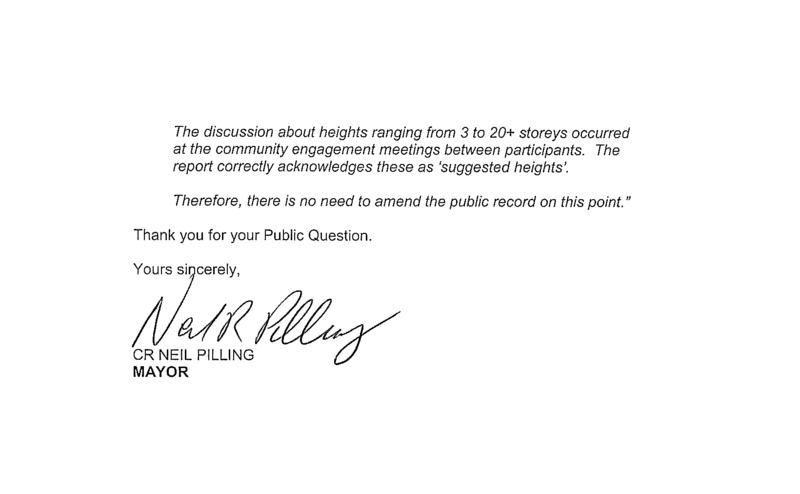 Clearly, after the review’s round table discussion, residents did not present 20+ stories as being an acceptable height to Council Rather, it was a something floated and discounted during the round table discussions. Bit of nit picking here. If the person wasn’t at the council meeting then Pilling is dead wrong. He did not “provide a response to your public question at the council meeting”. You are spot on. It won’t be long. The response indicates why Council does not want to include Public Questions into Council meetings. What a load of rubbish to document that 20 storeys were suggested by anyone in the community. What about some balance for the public record e.g. 10,000 community members requested up to four storeys in activity centres and one developer ordered 20 storeys. Never heard this and I was at all except 1 and never heard this even suggested. What a farce! Any ideas which one did you missed? Sounds like the QC needs to be called in again. Why? The last QC report is hidden by Pilling, the 2 times expert mayor, who ordered the report at our expense and he is now refusing to disclose the contents. Is there no one to order the report? Three reports costed the residents $44K+ more, an abuse that needs to be taken seriously. New community engagement process is being sought by the Council for its Transport Forum haveyoursaygleneira.com.au/transport-advisory…transport-forum/…/41376/download . That is the place to express your views and influence what the Council is doing.